Elsie Johnstone continues her journey traveling in India, passing by groups of pilgrims trudging along an arid countryside and participating in evening folk dances. Then, after she and her husband settled down in the Princess suite at the lavish Deogarh Mahal, they met the king. 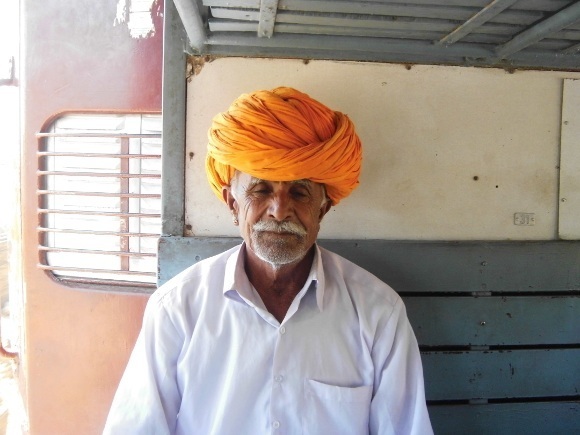 The journey from Jaipur to Deogarh took six hours. 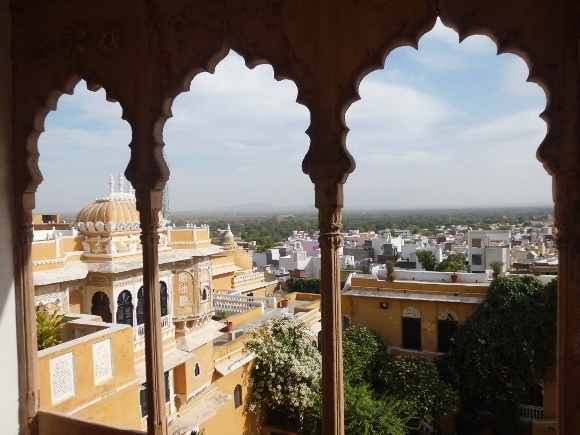 As Jaipur disappeared into the distance, the view out the window was desert and stunted trees. It is now mainly grazing country and the area reminded us very much of Greece. The saris are becoming increasingly brighter as we move away from the cities; turbans are red, bright pink and yellow. There are many more trucks and it is a very good road most of the way. Along the left hand side of the motorway, pilgrims carrying large red or green flags walk the 90 miles towards Ajmer on pilgrimage. It is 42 degrees C and the sun blazes down. “How often are they required to do that?” we ask. Each day our accommodation surprises and delights us. If we thought we were in luxury for the last few days, then we are literally living like kings at the Deogarh Mahal. Amazing! 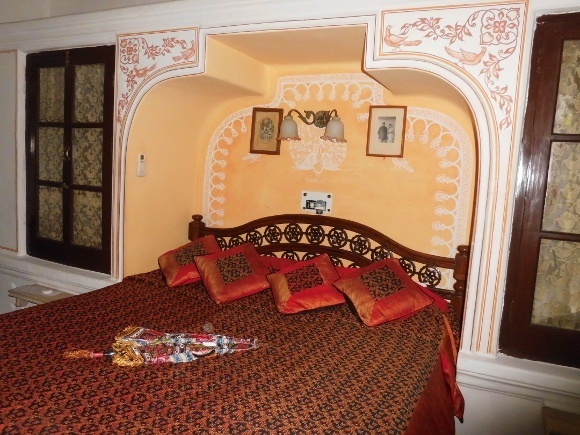 The palace is situated in a delightful, sixteenth century village with very narrow and winding streets. It is lavishly furnished in the style of the Raj. We have a bedroom, a sitting room, huge bathroom, our own large balcony as well as a rooftop retreat. It is the end of the season and there are only three couples in the palace tonight. The many staff watch and wait on us at every turn. We are overwhelmed with service! We have the Princess suite. Indira Gandhi slept in the bed we are sleeping in. Tonight we sat under the desert sky in the courtyard and watched two beautiful Indian dances weave their magic. They had me and a Mexican lady about the same age dancing with them. It was a real workout. Today I met a king. I have never met a king before. 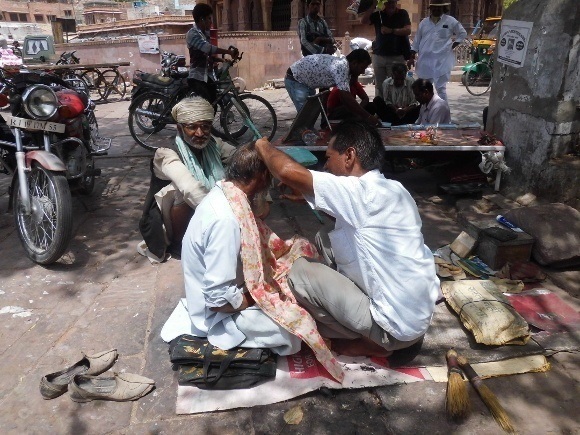 The man presented to us was a rather urbane handsome man in western clothes and elegantly greying hair. “Please call me BeBe,” he said as he shook hands. What an amazing place this is! Apparently the village is still mourning the old king who died eight months ago, aged 86 years. His daughter lives in Sydney and there is a sign outside the village stating that is 10,000 odd miles to Sydney. We stopped to take a photo with the king – who still lives in a wing of the palace. We had returned from a wonderful morning riding through rugged mountains in a local train. It was air-conditioned (no windows) with ergonomically, and sustainably designed seating (wooden benches). There was even the ability to convert the luggage rack into a bed if desired. Anil, our driver dropped us at one station and was waiting to retrieve us at another one an hour or so down the track. The train ride was fantastic. We chugged along at 19 miles per hour because it is law that the train goes no faster. The British organized the line using local labor in the 1930’s. They also organize a wall to be built on top of the mountains separating Jodhpur from Udaipur. Another classic case of the principle of divide and conquer! The wall is still there today, although broken down in places where shepherds go through. We passed an outdoor meeting of the village elders, all with white headgear. This evening we spent a magical two hours in an old army jeep travelling through mountain country and small villages to a lake where we watched the sunset as we drank tea. One of the best things we have ever done. We first called in on women and children who were making earth bricks. The children had been at school all day and now were helping their mothers stack bricks that had been made from earth and water and dried in the sun. Any Aussie who complains about his/her job at home should consider the women and men of India. On the way out, the villages were alive with children all wanting their photos taken. Not many families have i-phones or cameras so they are fascinated to see their image. They love a good high five as well. Returning after dark at about 7.30 pm, the villages were silent except for a few youths gathered around the well. These hard-working people are early to bed early to rise and sleep as soon as darkness comes. In some huts we could see the flicker of a small television set. Traveling in India can be a real treat! Experience India up-close like Elsie! Enchanting Travels customizes tours to Deogarh. Loved reading this report it took me right back to Deogarh and the wonderful palace.